Slugs are simply shell-less snails. 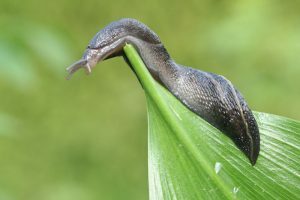 Slugs (snails) feed on a variety of living plants as well as decaying plant matter. They have chewing mouthparts and cause plant damage by creating large irregularly shaped holes in leaves with tattered edges. They prefer succulent foliage or flowers, seedlings, herbaceous plants, and fruit lying on or close to the ground, etc., but eat anything from garbage to feeding on bones. Hostas, by the way, are one of their favorite plants! There are several ways to help control slug and in most cases a combination of methods works best. Eliminate places where slugs can hide, like stones, debris, weeds, and heavy mulches, and try to use plants less susceptible to slug damages. Open up the areas to more sunlight and airflow, which slugs do not like. Have a ‘Slugfest’ to see who can pick the most slugs. Pick at night with a flashlight in hand. It is effective if done on a regular basis. Water the area before choosing to entice the slugs out. Trapping: Inverted melon rinds or grapefruit halves make great traps. Scrape off the accumulated slugs daily and destroy them. Beer-baited traps work nicely. Use empty tuna cans, place in the ground around plants and fill with beer (nonalcoholic beer works best). Slugs are attracted to the beer, fall in the can and drown. Empty and refill with beer as needed. Copper barriers around beds will keep slugs from entering. Using coarse sand, crushed egg shells, or used coffee grounds around desirable plants creates a border to help keep slugs out. Sprinkling the soil and or foliage with Diatomaceous Earth acts as a barrier; when slugs crawl across it, they are sliced and dehydrate. Even using pine straw for mulch seems to deter slug populations. Although results can vary, some herbs have worked as natural slug repellents, including anise, lavender, rue, wormwood, mints, cilantro, tansy, and lemon balm. Slug baits are probably the most consistent method of slug control, but not all are labeled for around edibles. Covered containers or bait traps can be used to minimize poisoning concerns. (Cut a 2-liter pop bottle in half and then invert the top part into the bottom part to create a no escape entryway into this homemade trap. Put your baits inside the container, which now protects it from the kids and wildlife.) Sluggo and SlugMagic are slug baits, less toxic / mush safer, and can be used around children, pets, wildlife, the garden, etc. Slugs have natural enemies, including ducks, geese, chickens, snakes, toads, turtles, birds, beetles, spiders, ants, harvestmen and firefly larvae. Invite these guys to your slugfest! *Always read and follow the directions on each recommended product before use. Actual slug control will vary due to many factors, and rarely is there ever 100% control. We do not recommend the use of salt in or on top of the soil for slug control.